Sean McKirdy tries to get on scoresheet but the Wee Gers were second best on the day. Berwick were left still searching for their first back-to-back victories of the season when they were beaten at home by bottom-of-the-table Cowdenbeath. A first-half goal from Robbie Buchanan was followed up by second-half counters from Brian Ross and Kris Renton, which helped the Fifers close the gap on the sides immediately above them in the Scottish second division. Berwick had been hoping to follow up a 4-3 home win over Clyde in midweek, but they were undone by Cowden, who picked up their first win of 2017, and their first in the league at Shielfield since 2008. Dale Carrick had an early shot which was hit straight at Sean Brennan and after 14 minutes he broke up the left, cut in and again shot straight at the Rangers keeper. On 16 minutes Cowdenbeath took the lead when Buchanan shot low under Brennan after jinking his way past his marker on the right. Efforts from Greg Rutherford and Stevie Notman were well wide as Berwick tried to respond, but Jamie Sneddon in the visitors’ goal was never tested in the first half and at the break the Fifers led 1-0. The second half was just 60 seconds old when Cowden doubled their lead. 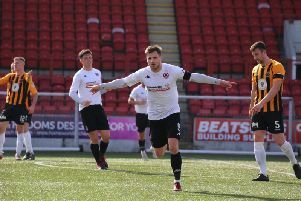 Skipper Pat Scullion kept the ball in play in the corner, but after it was headed goalwards from a cross by Liam Henderson, it was clawed away by Brennan but fell for Ross, who tucked it away. Just after the hour, Buchanan had a great chance to make it three for the visitors, but his close-range header from a Jamie Pyper cross on the right was directed straight at Brennan. In the 67th minute, Renton made it three and made the game safe when he ran on-to a long through ball and poked the ball past the advancing Brennan into an empty net. Rutherford netted a consolation for Berwick after 79 minutes, but this was Rangers’ first effort on target. Late in the game the visitors again went close to adding to their tally when a free kick was tipped on to the bar by Brennan. Berwick: Brennan, Hamilton, Phillips (Verlaque 68), Scullion (Fairbairn 68), Spark, Notman, Thomson, Lavery, Rutherford, McKirdy, Kessels, (Murrell 68). Cowdenbeath: Sneddon, Mullen, Pyper, Rumsby, McLauchlan, Rutherford, Henderson, Ross, Buchanan (Johnston 76), Renton (Glen 92), Carrick (Moore 83).